Hello Hello! 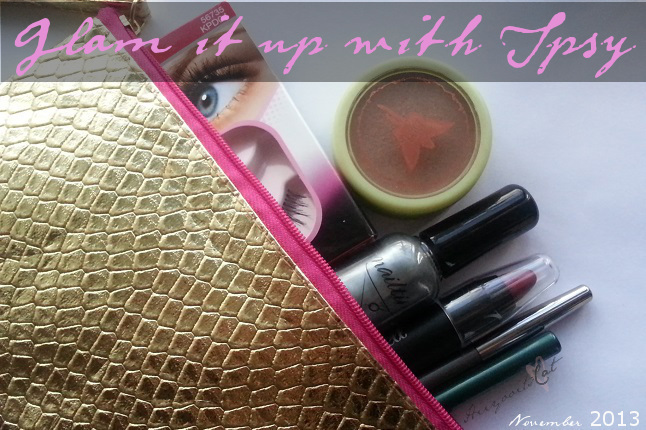 Ipsy's November bag theme is Glam It Up! They provided most products that would help you glam up for that special evening. 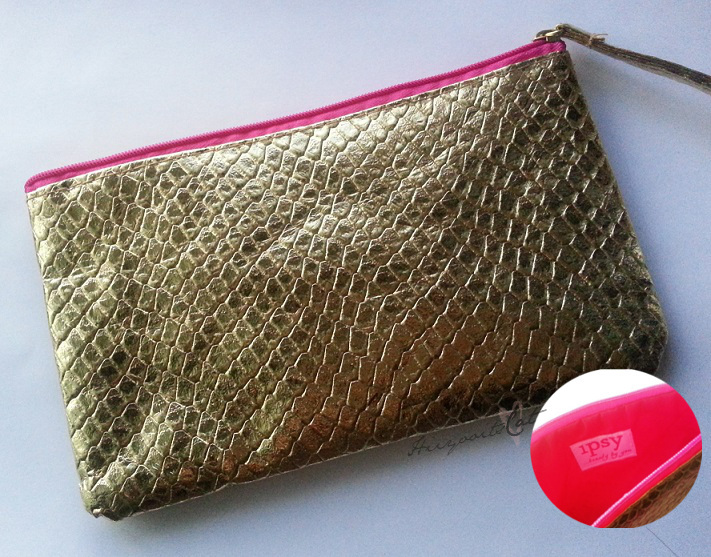 This month's bag has an reptile textured pattern and is a beautiful metallic gold. The zipper and inside trim is pink. 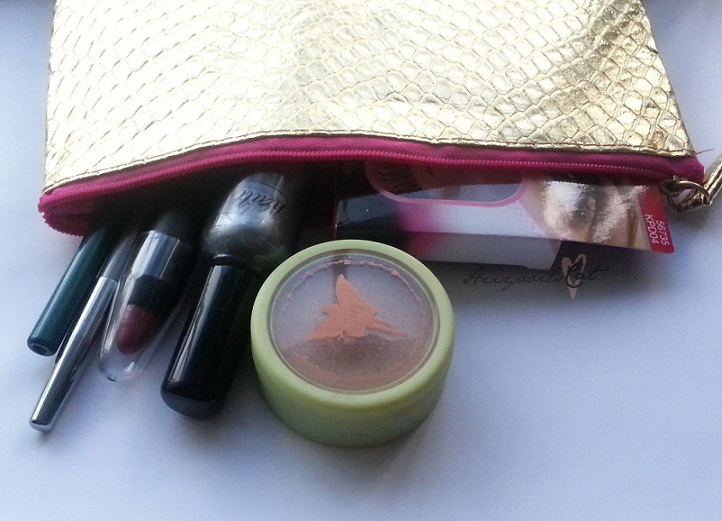 I received Pixi's Beauty Bronzer (without the kabuki brush) in Subtly Suntouched. It's very subtle.. a great winter bronzer. It has a little bit of shimmer in it but it doesn't show up much when applied to the face. I'm not a huge bronzer fan but the shade I received worked really well for me. I also received a full size Gem Eye Pencil by starlooks in Amethyst. I already own two other colors from this line and I absolutely love them. This gem pencil is very creamy and glides on like butter. It also stays for several hours (when I don't rub my eyes). I love using these on my tear ducts as well as lower lash line. I had another eyeliner in my bag (boo hoo, I was hoping for the lipstick) it was the waterliner by Em Cosmetics in Emerald. It is a very dark forest green. I already own the Ros Gold one and it is beautiful! This waterline is meant to stay put on the waterline without budging. I can't say it does just that but it does stay on for a few hours. It also has a smudge sponge on the other end of the pencil which I find unnecessary. I received another pencil product but this time it is a lip crayon by Be a Bombshell in Shameless. Shameless is a beautiful reddish berry color that contains a little but of shimmer. I was a bit turned off by the color but once I tried it on I loved it. It's great for fall/winter and I can definitely see myself wearing it during the spring/summer. I am certainly a false lash type of gal, so I was excited to see this in my bag. 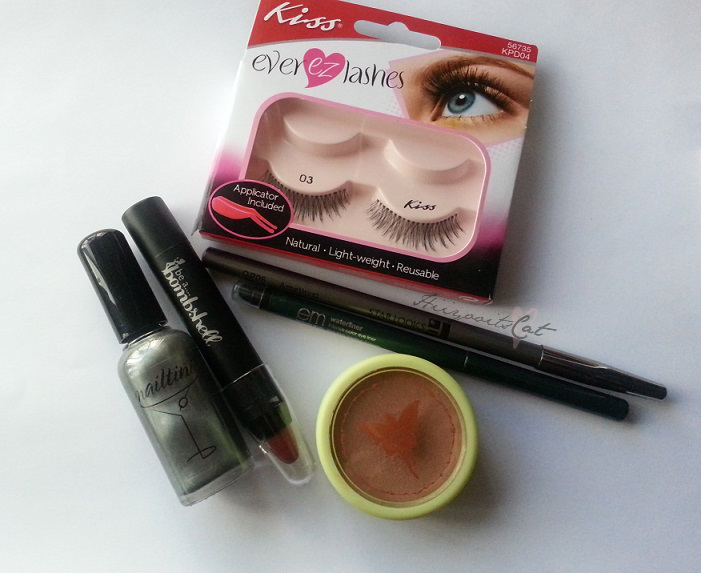 I received the Kiss ever EZ lashes in 03. I have been wearing these lashes non-stop and they still hold up well. They are really comfortable and the band is thin, so they look very natural. 2 pairs for $6? That's a great deal. Good Job Kiss! I got another nailtini polish in my bag this month in the shade Caviar Cocktail. It is a gun metal type of silver. In certain lights it looks regular and others it appears darker. I first heard of nailtini through IPSY and I love the polish "millionare", it is a gorgeous multi-colored gold glitter. Not a huge fan of the color but I can see it as a great stamping polish. My bag was worth over $60! That is amazing for only paying $10 a month for it. I do have to say that some of the products are a bit over priced but nonetheless with the amount I pay monthly I feel like I get some stuff for free =) It was a good bag and I do use all the products.